Greenbriar in Monroe, New Jersey is an active adult community that offers luxurious country club living. 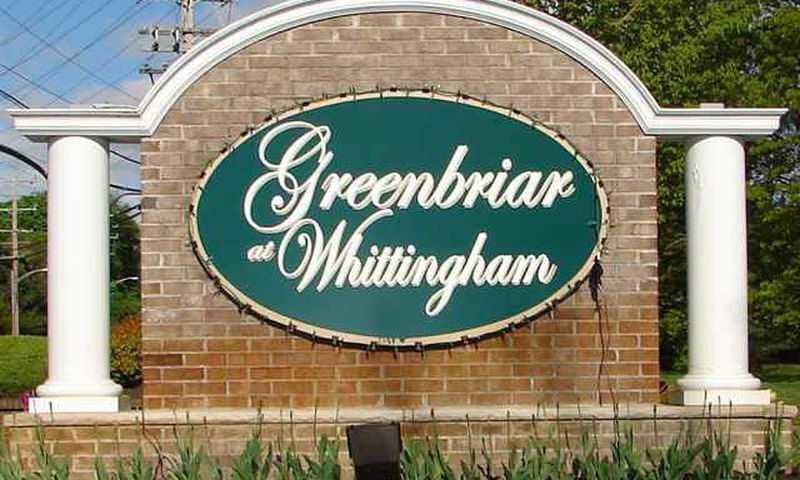 Greenbriar is adjacent to the Whittingham community. The two communities share a common clubhouse but have separate homeowners' associations. Collectively, the two adjoining communities are often referred to as Greenbriar at Whittingham but each neighborhood is decidedly different in the types of homes they offer. Greenbriar was built between 1995 and 2001 and includes 1,194 single-family and attached duplex homes. There is much to attract residents to Greenbriar, including its 30,000 square-foot clubhouse, wide variety of amenities and social activities, and close proximity to New York City, Philadelphia, Atlantic City and the Jersey Shore. The community staff includes a full-time activities director. Greenbriar residents have full access to the community's 30,000 square-foot clubhouse, which offers a full range of social and recreational activities. With plenty of space to socialize, residents can gather in the library, play a game in the billiards and card rooms or meet for a meal at The Tap Room. Those who want to stay in shape will love the large exercise room with aerobics studio, and hobbyists will make good use of the arts and crafts rooms. When it’s time to relax, the indoor swimming pool, spa and sauna make home feel like a resort. There is also an indoor walking track that overlooks the indoor pool. The clubhouse in Greenbriar also has an outdoor swimming pool for the warm summer months, and plenty of additional outdoor amenities. The beautiful 9-hole par-36 golf course spans 3,135 yards from the longest tees. There are also tennis facilities, shuffleboard and bocce ball courts, R.V. parking, and well-maintained walking and biking trails. Greenbriar has 1,194 homes, built by U.S. Homes, in both attached duplex and single-family designs. Greenbriar has their own association to manage lawn care and snow removal as well as common ground maintenance. The attached duplex homes at Greenbriar are available in five models. Each model includes a basic ranch floor plan and an optional loft. The available models range from 1,672 to 2,540 square feet. These homes have two bedrooms, two bathrooms, and a one-car garage. Greenbriar’s detached single-family homes are available in multiple floor plans and several offer optional lofts. These homes range in size from 1,751 to 2,639 square feet. These homes feature two to four bedrooms, two to three bathrooms and an one or two-car attached garage. Some homes also have optional basements. The residents at Greenbriar enjoy the luxurious active lifestyle found throughout the community. Residents can make use of the community’s 9-hole golf course, tennis facilities, hobby and game rooms, fitness center, swimming pools, outdoor sports courts, restaurant and other recreational activities. Some activities and events include table tennis, golf, yoga, bridge, dancing and much more. Greenbriar also supports a healthy social life with a wide variety of clubs and organizations. A full-time activities director is on hand to help residents make the most of all the community has to offer. Set in New Jersey’s beautiful Monroe, Greenbriar is centrally located and within close proximity to many popular destinations. Both New York City and Philadelphia are about an hour-long drive from the community, while Atlantic City and the Jersey Shore are approximately 30 minutes away. Greenbriar is located within two miles of the New Jersey Turnpike and provides easy access of other major highways, making it easy to take day trips or explore the surrounding areas. Closer to home, it’s easy for residents to find plenty of shopping, dining and recreational attractions. There are shopping centers, such as the Concordia Shopping Center, within a half-mile of the community. The Freehold Raceway Mall is only 15 minutes from home and offers over 100 stores, including several large department stores. The nearby towns of New Brunswick and Princeton offer theaters for the performing arts. Greenbriar is a beautiful and well-established 55+ community in Monroe, NJ. There are plenty of activities available in Greenbriar. Here is a sample of some of the clubs, activities and classes offered here. The attached duplex homes at Greenbriar are available in five models. These homes range in size from 1,672 to 2,540 square feet and feature two bathrooms, two bathrooms, and an attached one-car garage. Greenbriars detached single-family homes are available in multiple floor plans ranging from 1,763 to 2,639 square feet. Most homes have two bedrooms, two bathrooms and a garage. Some homes also have optional basements and second floors offering additional bedrooms. I just love this community. The clubhouse is huge, has a restaurant to gather with friends, a pretty golf course, and lots and lots of activities. The con I can think of is some of the homes are older and somewhat outdated, but many have been renovated. Most floor plans are open with vaulted ceilings for an airy feel. 55places.com is not affiliated with the developer(s) or homeowners association of Greenbriar. The information you submit is distributed to a 55places.com Partner Agent, who is a licensed real estate agent. The information regarding Greenbriar has not been verified or approved by the developer or homeowners association. Please verify all information prior to purchasing. 55places.com is not responsible for any errors regarding the information displayed on this website.